encourage early presentation of interval cancers. The NHS Commissioning Board recommends that breast screening units should cover a population of between 500,000 and 1,000,000 patients, and offer screening to women between 50 and 70 years of age, although this will be extended to 47–73 years by 2016.7 Screening usually occurs at 3-yearly intervals, but can be more regular for specific individuals. Provision of good quality, appropriate information empowers patients to make an informed choice and allows patients to opt out of the service on a temporary or permanent basis.5 Patients might choose to opt out of screening through personal choice, if already undergoing treatment for breast problems, or if there are medical/social issues that would make attendance of screening difficult. treat and care for people in a safe environment and protect them from avoidable harm. multidisciplinary team/clinical nurse specialist involvement in recurrent or metastatic disease. The NICE guideline on breast cancer relates to the recommended flow of patients through the pathway, whereas the quality standard adds fine detail relating to best practice at each stage of the cancer pathway. The NICE pathways for early and locally advanced breast cancer8 and advanced breast cancer9 are shown in Figure 1, and Figure 2, respectively. The NHS Outcomes Framework was first published in December 2010,10 and sits alongside similar frameworks for public health11 and adult social care.12 These three frameworks have been aligned to encourage collaboration and integration between services through the use of shared and complementary indicators. The NHS Outcomes Framework is structured around five domains, which set out the high-level national outcomes that the NHS should be aiming to improve.10 The first domain is involved with preventing people from dying prematurely from causes such as cancer, specifically breast, bowel, and lung cancer. As proposed in Liberating the NHS: commissioning for patients,13 the NHS Commissioning Board—with support from NICE, experts, and patient groups—developed the Clinical Commissioning Group Outcomes Indicator Set (CCGOIS)14 (formerly known as the ‘Commissioning Outcomes Framework’). Having identified the priority areas in the NHS Outcomes Framework, the CCGOIS details the key indicators that CCGs will be assessed against to show improvements in these areas. From April 2013, these indicators will become an integral part of the NHS Commissioning Board’s systematic approach to quality improvement, allowing measurement and benchmarking of CCG-commissioned service outcomes. The CCGOIS will also provide clear, comparative information on the quality and outcomes of health services, and may help patients and members of the public make more informed choices regarding their care. 1.4iv relates to 5-year survival for breast, lung, and bowel cancers combined. The above indicators measure premature mortality from cancer, which could potentially be reduced by earlier and more accurate diagnosis, optimal use of referral pathways, use of available interventions, and improving support for lifestyle changes (diet, smoking cessation, and physical exercise) after primary treatment. The end-of-life care quality assessment tool (ELCQuA) is a free online self-assessment tool,19 which commissioners can use to assess and support local service improvement across healthcare and social care. In 2010, the Government announced plans to improve access to certain cancer drugs not currently approved by NICE either on grounds of lack of cost effectiveness or evidence to support their use, or because the expected number of patients likely to benefit is too small. The Cancer Drugs Fund came into existence in April 2011 to provide funding for such drugs in England (this does not apply to Northern Ireland, Scotland, or Wales).20 The aim of this fund was to empower clinicians and cancer specialists to use their professional judgment to make decisions in the best interests of their patients. A panel of specialist professionals in cancer care was set up in each region to decide which drugs should be available through the fund and in what circumstances—often called a ‘priority list’. Cancer specialists can then apply in order to fund the treatment of individual patients. The Cancer Drugs Fund is intended only as an interim measure, and in 2014, the Government is planning to implement a ‘value-based’ pricing system for branded drugs,21 which aims to make cancer drugs more widely available on the NHS. the current difficult financial climate may drive decisions based on efficiency savings rather than improving outcomes. The changes across the NHS are likely to have a significant impact on all aspects of cancer care. There is a drive to encourage more integrated working across healthcare, public health, and social care in an effort to improve the quality of services. There is increasing emphasis on benchmarking services against predetermined quality standards and for the newly emerging CCGs to be held accountable for the services they commission. CCGs should ensure that the men with breast cancer (~1%) have their needs specifically addressed in care pathways. Department of Health website. Health and Social Care Bill explained. healthandcare.dh.gov.uk/factsheets/ (accessed 8 March 2013). National Institute for Health and Care Excellence website. Quality standard for breast cancer. Quality Standard 12. London: NICE, 2011. Available at: publications.nice.org.uk/breast-cancer-quality-standard-qs12 (accessed 21 February 2013). NHS Breast Cancer Screening Programme website. Age extension full randomised control trial. www.cancerscreening.nhs.uk/breastscreen/research-age-extension-full-rct-faqs.html (accessed 22 February 2013). National Institute for Health and Care Excellence website. 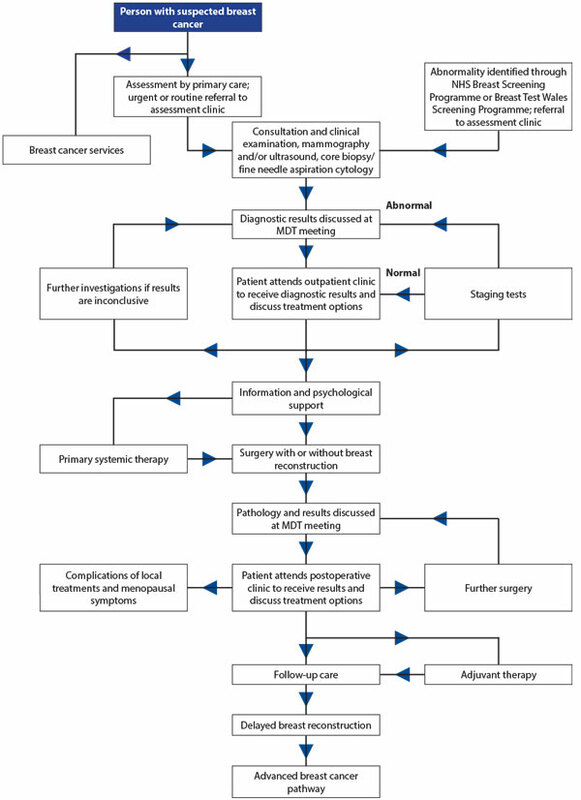 NICE clinical pathway for early and locally advanced breast cancer. pathways.nice.org.uk/pathways/early-and-locally-advanced-breast-cancer (accessed 19 February 2013). National Institute for Health and Care Excellence website. 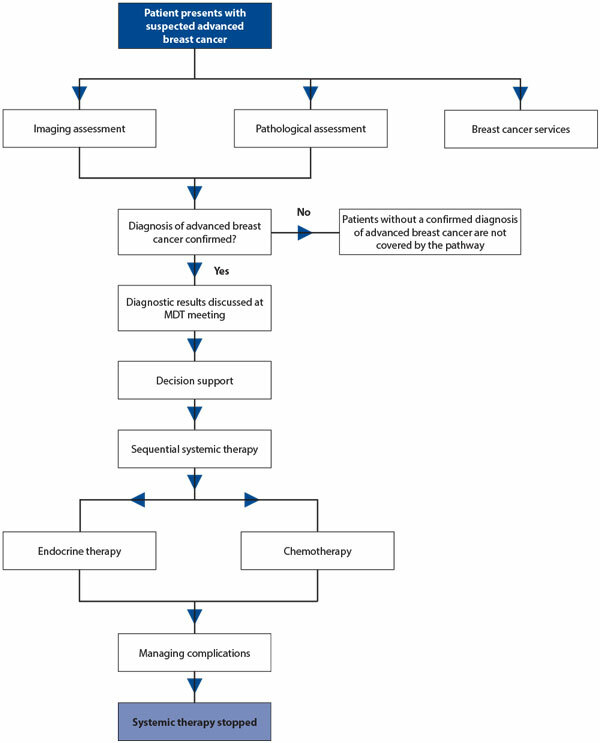 NICE clinical pathway for advanced breast cancer. pathways.nice.org.uk/pathways/advanced-breast-cancer (accessed 19 February 2013). National Institute for Health and Care Excellence website. Quality standard for end of life care in adults. Quality Standard 13. London: NICE, 2011. Available at: publications.nice.org.uk/quality-standard-for-end-of-life-care-for-adults-qs13 (accessed 21 February 2013). End of life care quality assessment tool (ELCQuA) website. www.elcqua.nhs.uk (accessed 19 February 2013). Cancer Research UK website. Cancer drugs fund. www.cancerresearchuk.org/cancer-help/about-cancer/cancer-questions/cancer-drugs-fund (accessed 19 February 2013). Legislation.gov.uk website. Health and Social Care Act 2012. www.legislation.gov.uk/ukpga/2012/7/contents/enacted (accessed 22 February 2013).